I just ordered this baby, custom for the C-HR and puts your phone in an optimal position! Will update once I receive it, which will probably take a while. Oh.. But then you can't adjust the vents vertically, right? 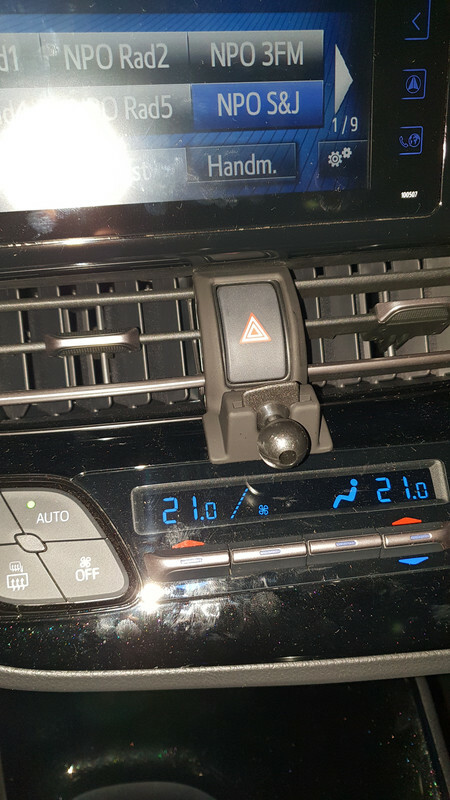 There IS a sticky tape layer whish you can peel off to stick it to the dash, but after trying to test it I could just click it in to position without using the sticky part. So that's a plus! When you put the dock part in (on the balljoint) it sits there comfortably and tightly. The dock does feel a little bit flimsy, but when you tighten the ball lock it will stay in place. The only real issue is my phone itself, I have an S9+ with the original Samsung flip case, which makes it to thick to fit in the openings of the holderarms. Upright however there is enough grab that it wont fall out though even over bumps and through tight curves. Panoramic wont work with my phone case on. Without it works perfectly in horizontal and landscape. All in all an ok buy for 21$ incl shipping! So the vents can still be adjusted?